Preface: This adventure vacation itinerary includes a lot of great tours with the majority of your time spent out and about. Therefore, it is recommended that for hotel accommodations you choose a nice budget or economy hotel with clean basic amenities rather than a more expensive lodging option at a boutique hotel, condo rental, or an all-inclusive resort. It’s arrival day and you’ll hit the ground running. Unpack your suitcase and freshen up for the evening’s activities. Walk around your resort to become familiar with the on-site amenities before heading out to Vallarta Adventures for your pre-booked 7 p.m. tour: Rhythms of the Night. After this incredible excursion you’ll return back to your hotel around midnight. It’s time to hit the sack and recharge your batteries for the following day. Rhythms of the Night tour by Vallarta Adventures. The evening includes a one-hour catamaran ride on the bay each way with unlimited drinks and entertainment. 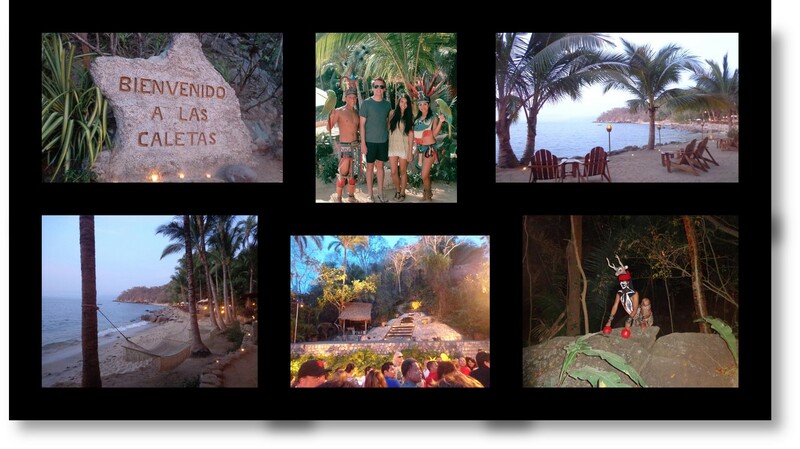 Once at Las Caletas Beach for their evening program you are greeted with a photo op and a fabulous buffet dinner and a top-notch show in the outdoor amphitheater. After a light breakfast pack your beach bag and head north to Sayulita. With surfboard rentals and lessons available right on the sand, spend the early afternoon participating in water activities in the ocean mixed with some relaxation time on the beach. For lunch enjoy delicious fish tacos and ice-cold beverages at a beachfront eatery. In the late afternoon take a walk around town to explore this lively Bohemian paradise. Then take a walk directly in front of and past the lovely Villa Amor beachfront hotel heading south, turning left around the bend and up and over the hill leading to the colorful cemetery. After the cemetery you will reach Sayulita’s gorgeous Los Muertos Beach. Do a little exploring around the rocks and coves at the ends of the beach before walking back into town for dinner at one of many cute little restaurants. Return to your hotel and relax with a drink at the bar before bedtime. 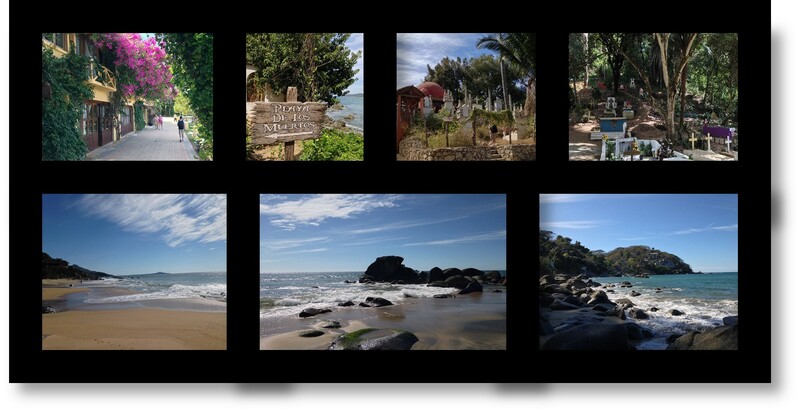 To reach Los Muertos Beach in Sayulita, take the pathway directly in front of Villa Amor. At the end of the Villa Amor property you will see a sign with an arrow pointing you in the correct direction. Turning left, walk up and over the hill, through the cemetery, and you will arrive at this precious hidden beach. 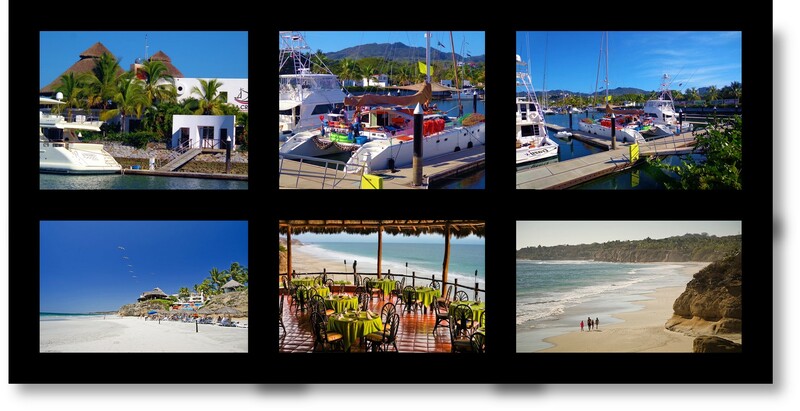 No need to eat breakfast before heading out to Marina Riviera Nayarit in the town of La Cruz de Huanacaxtle for a pre-booked tour with either Ally Cat Sailing or Chica Locca (these tours are very similar and the catamarans just happen to be docked fairly close to one other). Enjoy a light breakfast, a delicious lunch, and an open bar on your way to snorkel to the Hidden Beach at the Marieta Islands. After a full day of sailing and adventure, head to nearby Punta de Mita to have dinner at Pepper’s restaurant in the Ranchos Banderas Resort complex. The restaurant is situated on a bluff overlooking the sparkling ocean and Destiladeras Beach. Right after dinner take a few steps down to the beach and sit in the sand while gazing out at the sunset. Return to your hotel for a nice shower before bedtime. Top Row: Marina Riviera Nayarit and Ally Cat catamaran. Bottom Row: Peppers Restaurant within Rancho Banderas Resort along gorgeous Destiladeras Beach. The day starts early at 8 a.m. for your pre-booked Vallarta Adventures Extreme Zipline Adventure. Over six exhilarating hours you will zip line through the jungle canopy, rappel down elevated tree platforms, and go zooming around the tropical jungle floor on ATVs, then cool off with a splash as you slide down a hill with twists and turns on a thrilling hillside waterslide. After returning to your hotel to freshen up, it’s time to head to the gorgeous Malecon in Puerto Vallarta to check out the lively scene, do a little shopping and scout out a great place for dinner. As the night sky darkens, head out to the Los Muertos Pier to enjoy a panoramic view of the city’s twinkling lights as they reflect soothingly off the water. A return to your hotel by 10 pm will assure that you’ll have a great night’s rest. Take a bus or a taxi out to Boca de Tomatlan, along the way enjoying spectacular views of the stunning Pacific coastline. From Boca take a water taxi ($70 pesos per person, each way) to the enchanting village of Yelapa with the fabulous beach and easy-to-get-to nearby waterfall (the second waterfall is about an hour’s hike from the first one). Usually the last water taxi departs Yelapa at 5 p.m. for the return trip back to Boca, but before you step off the water taxi be sure to verify the time of final departure. Spend a few hours exploring the village and hiking up to the closer of the two waterfalls, having lunch at one of the little restaurants you discover along the way. 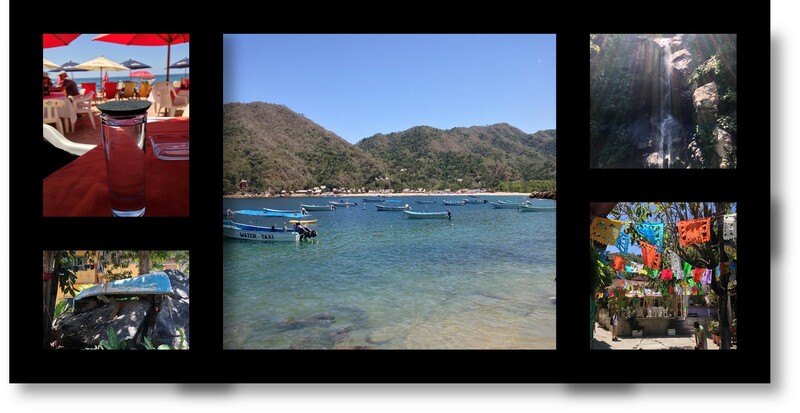 Then head back to the beach to relax along Playa Yelapa and maybe even enjoy one of their famous little pies that are sold by beach vendors that walk up and down the sand, or perhaps order a Raicilla beverage at a beachfront restaurant. After a full day of exploration and fun, depart on the water taxi to head back to Boca de Tomatlan. From Boca ride the public bus back into Puerto Vallarta. Spend the early evening exploring the Romantic Zone and all of its wonderful shops, bars and restaurants. Select an eatery along the beach where you can dig your toes into the sand while sipping on cool beverages, enjoying a great meal, and viewing the sunset. When you’re feeling tired, head back to the hotel and relax a bit before bedtime. A water taxi as viewed from Yelapa Beach; Raicilla beverage while sitting at a restaurant in Yelapa; Yelapa waterfall; photos taken around the village of Yelapa. Pack your beach bag and head out the door to Vallarta Adventures for your 8:30 a.m. pre-booked 7-hour Las Caletas Beach Hideaway tour. Enjoy the relaxed but fun atmosphere aboard a catamaran that glides across the water for about an hour before arriving at your destination. Spend the afternoon winding down at this secluded beach, going snorkeling, kayaking and paddle boarding. Enjoying the luxury of an open bar, snacks and a wonderful buffet lunch. By about 3:30 p.m. your tour will be over and you can head back to your hotel to shower off and change clothes. Then head out the door and back to the Malecon to walk over the pedestrian bridge that crosses the Rio Cuale. In the middle of the bridge take the steps down to the tiny island: Isla Rio Cuale to visit the famous Rio Cuale Flea Market. This is a great opportunity to shop for some great souvenirs and gifts to take back home. If time allows, take a taxi to the Cuale Paradise restaurant for a wonderful pina colada and delicious dinner at a very unique location along the Rio Cuale where experiencing special ambiance is the main attraction. After dinner retreat back to your hotel, start packing your luggage and then head for bed. 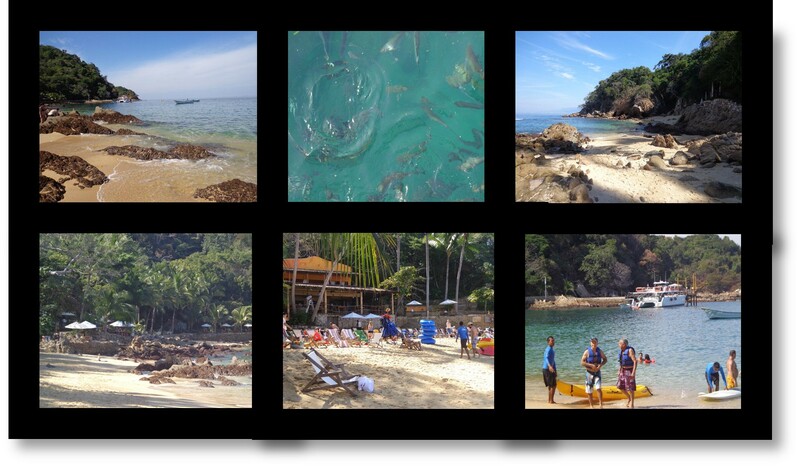 Vallarta Adventures Las Caletas daytime beach excursion. Beautiful lunch buffet, unlimited drinks and plenty of fun activities. Ask for a late check-out time at your hotel so you can leave your packed luggage inside your hotel room until you return around 11 a.m. after a quick and fast-paced early morning activity. The coolest new adventure in watersports is flyboarding. So first thing in the morning head back to Vallarta Adventures for this pre-booked tour that from start to finish will last about 1.5 hours. After experiencing this unique and thrilling activity, it’s time to return to the hotel and finish packing things up. When booking your hotel be sure to ask if after check-out time if you can leave your luggage in a safe area behind the front desk or in a special secured area while you enjoy the swimming pool until it’s time to change clothes in the hotel lobby restroom and head to the airport. After a week of exciting adventure activity, you’ll be leaving for home with an incredible number of long-lasting memories of your adventure-filled vacation in paradise!